If you look at a map of South Eastern Australia showing the boundaries between Victoria and New South Wales with South Australia you will see a kink in the line at the Murray River. 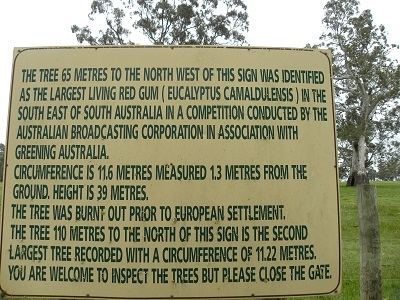 The border South of the Murray, that is the border between Victoria and South Australia, is slightly west of the line above the river. The story of why this is so is too long to tell here but I found an interesting article on Wikipedia. The border was originally determined by the House of Commons in London and was defined as the 141st Longitude. The trouble is that even with three attempts at surveying this line, the equipment of the day was simply not good enough to get it right. Why did it matter? Well the Victorian Colonial Government sold land to settlers over which it did not have sovereignty, there were disputes around policing and South Australia was aggrieved. The dispute was still on going after the Federation of Australia and was not resolved by the High Court of Australia and South Australia took its case to the Privy Council. The Privy Council ruled unanimously in favour of Victoria. 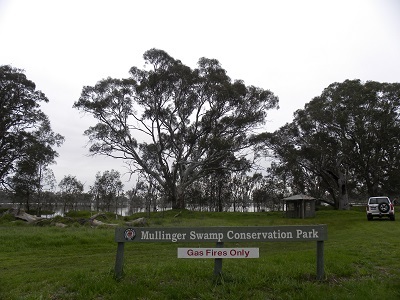 Well if the ruling had been determined in SA’s favour the present Mullinger Swamp Conservation Park and the Victorian Reserve would have been in SA. 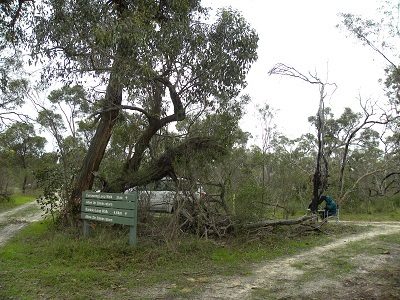 My first park for the day was Mullinger Conservation Park and what an interesting place it is! 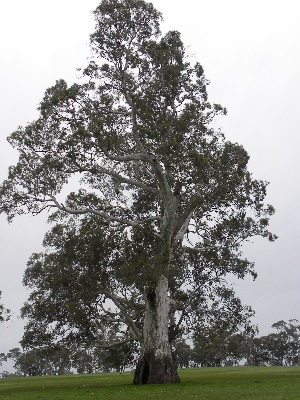 The swamp straddles the border between South Australia and Victoria. The survey marker showing the current border is clearly marked. The greater part is in Victoria. Twelve contacts were made: VK5PAS/p QRP, Paul on a peak, I think 019; VK5ATW, Trevor; VK3AFW, Ron; VK3UBY, Col; VK5LY, Larry; VK5FMID, Brian; VK5PAS/p QRP, Paul; VK5LY/p QRP, Larry (park to park); VK5CZ/p QRZ, Ian, Lagoon Hill VK5 SE 008; VK3PF QRP, Peter; VK3HRA, Allen and VK3MCD, Brian. Bangham Conservation Park protects native vegetation and various species of birds and other wildlife. There are no visitor facilities. Three contacts were made: VK5LY/p, QRP, Larry at Danggali Conservation Park – a park to park contact was a great start for the this park! Also worked were VK5DJ, John and VK5CZ/p, QRP, Ian on Lagoon Hill. It was raining steadily and I decided to close down and move on to Padthaway where we had lunch. Fourteen contacts were made: VK5LY/p, QRP, Larry at Danggali Conservation Park; VK5KGP, Graham; VK5JK, Jeff; VK5LI, Craig; VK5NZ, Bob; VK3AMB, Bernard; VK3AFW, Ron; VK5HOS, Owen; VK5FUZZ, Paul; VK5ZK, Garry; VK5WK, Graham; VK3KRH, Roscoe; VK5WF, Wolf and VK5DJ, John. 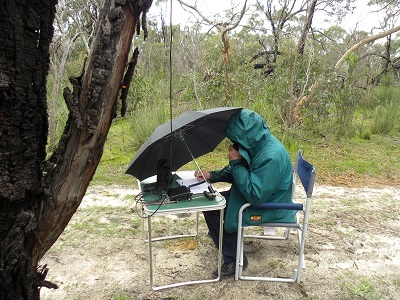 I was very happy with 14 contacts, huddled under an umbrella and trying to keep the rain from my log.